Those people who were believed to be able to see into the future were revered figures in Ancient Greece, and as a result many important mythological figures also had prophetic abilities. Some of these figures were born with the gift of foresight, whilst many others had the gift bestowed upon them, and the god Apollo was particularly noted for dispensing the prophetic powers upon mortals. Indeed, it was Apollo who gave arguably the most famous female seer, Cassandra, the ability to see into the future; although in the case of Cassandra the ability was a curse rather than a gift. Cassandra was a mortal princess of the city of Troy, for Cassandra was the daughter of King Priam of Troy, and his wife Hecabe (Hecuba). Cassandra would have many siblings, for some said that Priam fathered 100 children, but amongst the most notable were Hector and Paris, and also Cassandra’s twin brother Helenus. Cassandra was also known as Alexandra, in a similar way to how Paris is sometimes referred to as Alexander. Cassandra would grow up to become the most beautiful of all of King Priam’s daughters and as a result she had many potential suitors, both mortal and immortal. Zeus was of course well known for keeping an eye out for beautiful mortals, but in the case of Cassandra it was actually his son Apollo who vied for the daughter of Priam; and in the most common version of the Cassandra myth, it is Apollo who enables Cassandra to see into the future. In this version of the story, Apollo, smitten with the beauty of Cassandra, attempts to seduce the mortal princess. To help sway Cassandra, Apollo offers up the gift of prophecy, a gift which Cassandra willingly accepts. Having accepted the gift though, Cassandra then rebuts the sexual advances of Apollo. A spurned Apollo could have simply taken Cassandra’s new ability away from her, but in an act of vengeance, Apollo instead decides to curse the woman who spurned him. ​Thus, from that day on, Cassandra’s prophecies would always come to pass, but no one would ever believe her predictions. ​Subsequently, Cassandra would then teach her twin brother Helenus how to see in the future, and so good was Cassandra as a tutor that Helenus’ predictions would also always come true, although of course, Helenus’ would be believed. An alternative version of the Cassandra myth has brother and sister receiving their prophetic abilities at the same time; for when still babes, Cassandra and Helenus were left overnight in the temple of Apollo. During the night, two serpents emerged from the dark recesses, and made their way to the two children of King Priam. The serpents then licked clean the ears of Cassandra and Helenus, allowing both to hear clearly the sounds of nature, allowing accurate divination of the future. Later on, Cassandra would spurn the advances of Apollo, and in the same way as the first version of the Cassandra myth, Apollo would curse the Trojan princess so that her predictions were ignored. Mortals though were also spurned by Cassandra, and some say how Telephus, a son of Heracles was rejected by Cassandra, although in the case of Telephus, Cassandra did help the future king of Mysia wed her sister Laodice (or Astyoche). Later, other suitors of Cassandra were said to include Othryoneus of Cabeus and Coroebus of Phrygia. Cassandra comes to prominence in Greek mythology because of events at Troy. Some ancient sources tell of how Cassandra predicted the destruction of Troy when Paris was born to Hecabe, and told how her new-born brother should be put to death, the prophecy though was only listened to when Cassandra’s half-brother, Aesacus said the same thing. This story is normally ascribed to Aesacus alone. Cassandra’s first commonly told prediction again involves Paris, but from years later, when her brother returns to Troy with Helen, wife of Menelaus in tow. Hector would chastise his brother for his actions, but Cassandra told how she now saw the future ruin of Troy, but of course, as per the curse of Apollo, Cassandra was ignored. The abduction of Helen would of course lead to the Trojan War, and during the war Cassandra would witness many of her brothers die in defence of Troy. Eventually, the Achaeans came up with a plan to finally take the city of Troy, and a Wooden Horse was constructed, and then seemingly abandoned outside the city walls. Cassandra immediately saw what would happen if the Trojans were to take possession of the horse, and whilst Cassandra tried to convince her kinsmen of the risk, she was of course ignored. Thus, the Wooden Horse, with its belly full of Achaean heroes, was taken into Troy, leading, that night, to the Sacking of Troy. As the Greek heroes took possession of Troy, Cassandra would seek sanctuary within the Temple of Athena, in the heart of the city. The temple though proved to be no refuge, just as the Temple of Zeus proved no sanctuary for Priam and Polites. Cassandra was found in the temple by Ajax the Lesser, and there the daughter of King Priam was raped by Locrian Ajax. This was one of the acts of sacrilege which would see many of the Greek heroes endure long and perilous journeys home after the war. With the fall of Troy, Cassandra became a prize of war, and Agamemnon, as commander of the Greek forces, received his fair share of the spoils, and Cassandra became a concubine of the King of Mycenae. Indeed, Cassandra would give birth to twin sons for Agamemnon, Pelops and Teledamus. 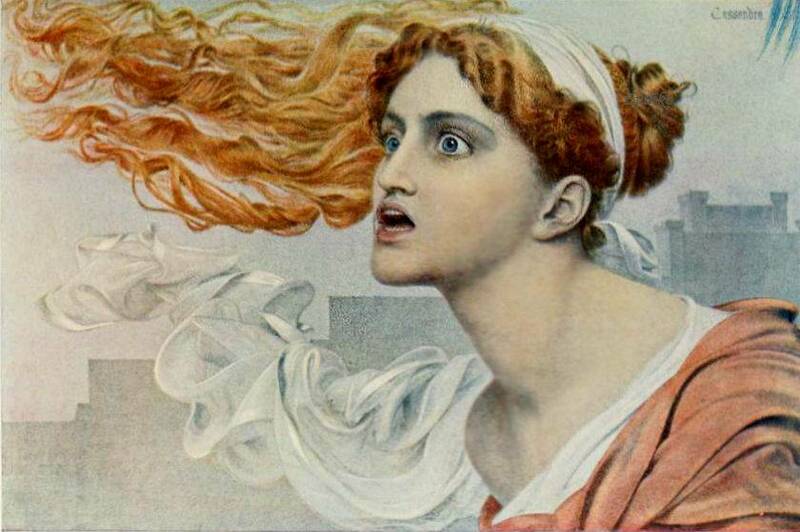 Despite being a slave of Agamemnon, Cassandra still attempted to warn the king of his, and her own fate if they were to return to Mycenae; for Cassandra knew that they would be murdered, for Agamemnon’s wife, Clytemnestra was having an affair with Aegisthus. ​As with all of Cassandra’s predictions this was ignored, and so Agamemnon did indeed die after surviving the Trojan War. Aegisthus would also kill Cassandra, and the two sons she had born to Agamemnon. A less common tale told in History of the Fall of Troy (Dares of Phrygia) sees Cassandra not in the company of Agamemnon when he returned home, for the King Of Mycenae had given Cassandra, her brother Helenus, her mother Hecabe, and her sister-in-law Andromache, their freedom after the war. These four former Trojans would make a new home for themselves in Thracian Chersonese (Gallipoli peninsula).